Make a simple bell skirt with this sewing tutorial - beginner friendly! Looking for a free bell skirt sewing pattern? This simple tutorial will walk you through sewing a cute women’s skirt like this one! I consider myself an Anthropologie sale stalker so when I saw Reachel from Cardigan Empire wearing this little number above on the right I was shocked and appalled that I hadn’t seen it. The problem was that not only was it sold out on Anthro’s site but the few left on eBay were selling for upwards of $160. Ugh. Even I have limits. The Anthro reviews were stellar on this skirt and, although this is a very simplified version, I have to say it is one of the cutest, most flattering skirts I own (especially at this more voluptuous time of my life). What with the fitted waist and ample hiding room for your bottom half, I can promise that it would look great on just about any woman. Plus it’s a breeze to make, even without a pattern. Promise. I started by buying 2 yards of upholstery-weight black and white cabana stripe fabric (57” wide) from this Etsy shop. Then I bought a yard of 2.5” wide black elastic from this shop. I knew I wanted a contrasting zipper in the back but I couldn’t decide on pink or green…I eventually went with an exposed gold one instead. First of all, the fabric was vertically striped so I turned it 90 degrees so that it was 57” tall and 1 yard wide. I then folded it in half the long way and cut it along the fold (in half). I ended up with 2 pieces, both measuring about 28” x 36”. Now make your pleats. I made one box pleat (here’s a good how-to) by creating a fold about 4 inches from the center and bringing it into the midline on both sides, then made two (2”) knife pleats roughly halfway between the center pleat and the edge of the fabric. Do this to both pieces of fabric, the front and the back of skirt. Of course your exact placement of pleats is up to you…play around with it and see what looks good! Sew the pleats in place using a basting stitch, and then sew your side seams, right sides together. My fabric unraveled pretty easily so I made sure to serge all my edges. Now, you’ll want to slit your back piece of fabric in the center about 6 or 7 inches down, depending on the length of your zipper. Don’t forget that your zipper will have to be attached to your wide elastic as well. I used a 9” zipper. This is where you’ll want to try your skirt on and fit it to your natural waist. One of the great things about this skirt is its really high waist since it hides muffin top like nobody’s business. You’ll probably need to take your side seams in a bit unless you’re a sewing ninja and already made your pleats just the perfect width. Having never seen the actual Anthro skirt in person, I kinda winged the waistband. I decided that I wanted it fitted (not stretchy) to hold me in but I still liked the idea of the elastic to act almost like a girdle (it does!). So I folded the elastic in half widthwise (to find the center) and began pinning the center of it to the skirt at the front pleat, and continuing all the way around to the slit at the back, on both sides. I then installed the zipper (you can topstitch around the zipper if you like) and hemmed it right at the knee. Did I mention that this baby cost me about 25 bucks total? Yeeeah! I haven’t cleaned it yet but I’m assuming it’ll need to be dry cleaned or spot cleaned. 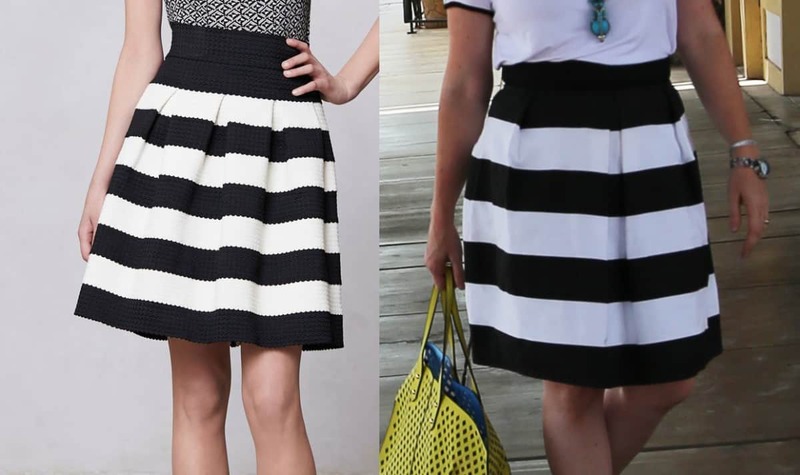 An alternative would be to make your own striped fabric by sewing some strips of white and black washable cotton together. Just make sure you pick something fairly stiff so that you get the “bell” effect. Have you seen this super simple skirt making tutorial? It’s super flattering and requires no buttons or zippers! looks great bonnie!! love it with the pink cardigan! lovely skirt! how wide are the stripes on that fabric? 3 inches?